When trading in foreign countries, we must comply with international laws and provisions, not to mention laws specific to Japan and other nations. For example, safe transport of hazardous cargo requires labels and markings to ensure proper handling. 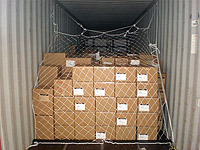 Naturally, such cargo must be securely packaged and stabilized within the container. In addition, appropriate packaging tremendously increases loading/unloading efficiency and operational safety. Remember, all your hard work to win new business is wasted if your product does not reach the buyer complete and in perfect condition. Japan Express provides fast, cost-effective services such as labeling, marking for hazardous cargo, and packaging for export at our own facility. Labelling and marking of hazardous cargo. We undertake a wide range of tasks --- cargo handling, warehousing, customs-broking, packaging, labelling and stuffing into ocean containers at our Uozaki warehouse. Toxic substances Insecticides, dyestuff, medical substances, etc. Infectious substances Bacteria, virus, medical residue, etc. Appropriate packaging is indispensable for safe transport of cargo. 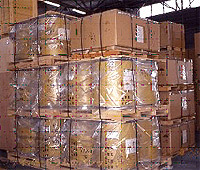 Packaging methods vary depending on the characteristics and shape of the cargo. However, the container itself is subject to intense shock and vibration during ocean transport, so stacked cargo must be appropriately stabilized in the container. When it comes to addressing this and other issues, many customers depend on Japan Express' know-how to provide optimum service at a reasonable cost. Covered with vinyl sheet and packed in a crate box. Common for machinery and heavy cargoes. Covered with cardboard on skid and tied with bundles. 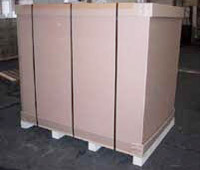 Carton boxes on skid covered with stretch film. For electrical goods, etc.. 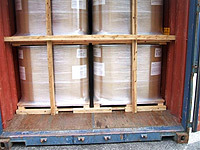 Drums on wooden pallet for forklift handling. 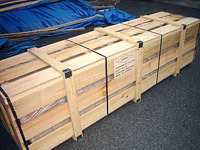 Palletized cargo is secured by timber. 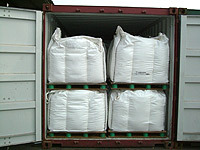 Flexible container bags on pallet. 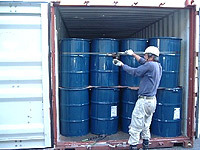 Drums stuffed in breakbulk in a container, some drums near the door are secured tightly with steel bundles. 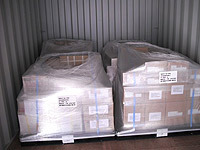 Carton boxes stuffed in breakbulk in a container are secured with net.